Before coming home tonight, I got a view of the Station Fire from the 14th floor of my girlfriend’s Marina Del Rey high-rise. It was impressive that the fire was visible from that far away. And it was a bit scary to think that I was about to get in my car and go to my house, which is almost directly underneath it. Eep. This morning, I’d planned on doing a bike ride to the south, away from the mountains and the smoke from the Station Fire. But when I went outside, the smoke was so thick I could barely see to the end of my block. So riding around here seemed like a really Bad Idea. So I hatched a plan to go riding somewhere else. I called Newton, who lives out in West Covina, and I asked him what the air was like there. 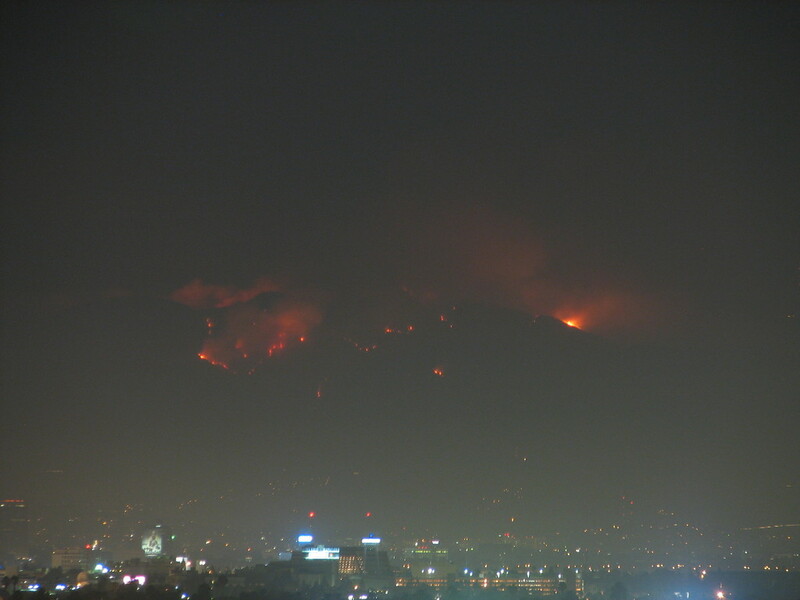 He said it was fine, but that he could see that Pasadena was completely invisible under a blanket of smoke. So I figured out a route to start in Covina and go over Carbon Canyon into Brea. It was 41 miles, and would be nowhere near the smoke. I went down to the park just to see if anyone else would show up. I figured we could all go in my car and go riding out there. But nobody else was there, so I just headed out by myself. 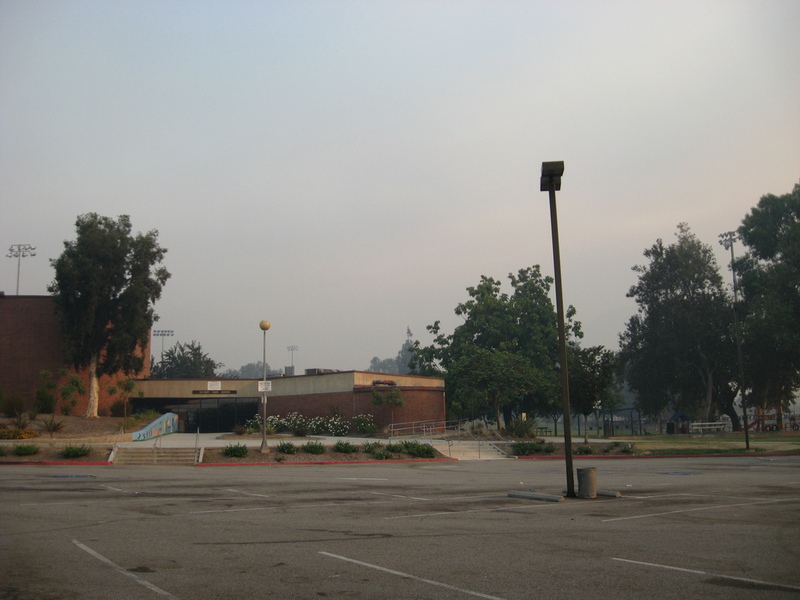 The first picture shows the view from the park, looking towards the mountains. And there are mountains there, even if you can’t see them. They are only about 2 miles away, which gives you an idea how thick the smoke was. As soon as I got a few miles east, the smoke cleared, and it was a pretty nice day. I parked at Covina Park and mounted up to ride. 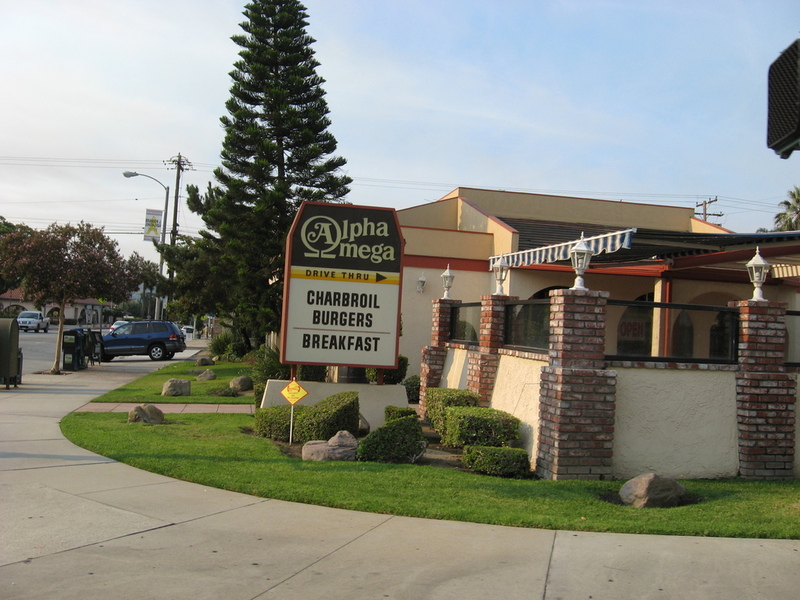 I passed Alpha Omega Burgers, which I thought was funny, since that was the name of the doomsday bomb in “Beneath the Planet of the Apes“. Perhaps they should have a slogan, “Our Burgers are the Bomb”. 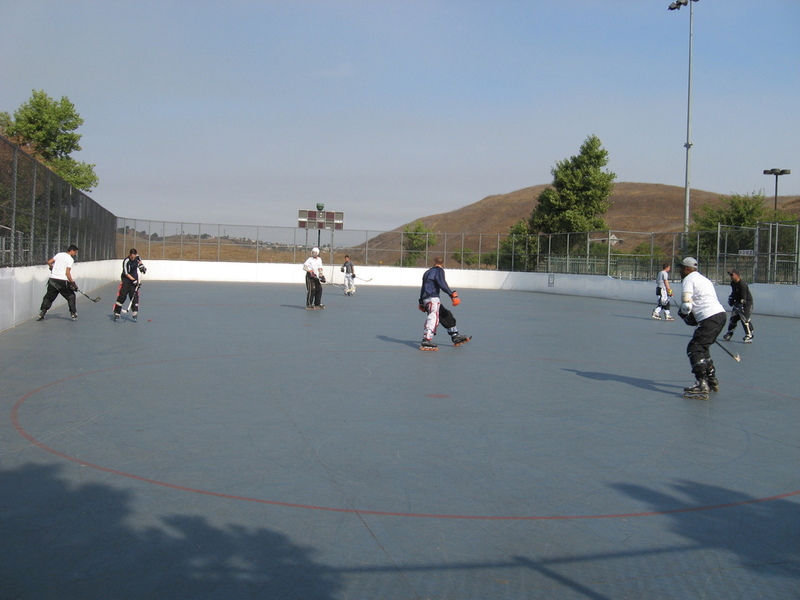 When I got to Chino Hills, I saw some people playing rollerblade hockey. That was kind of novel, since I’ve only ever seen hockey played on ice before. I found a hot-rod mailbox on Carbon Canyon Road. At the top of the hill, I balanced the camera on a fence post for a picture. Then I headed down the other side into Brea. 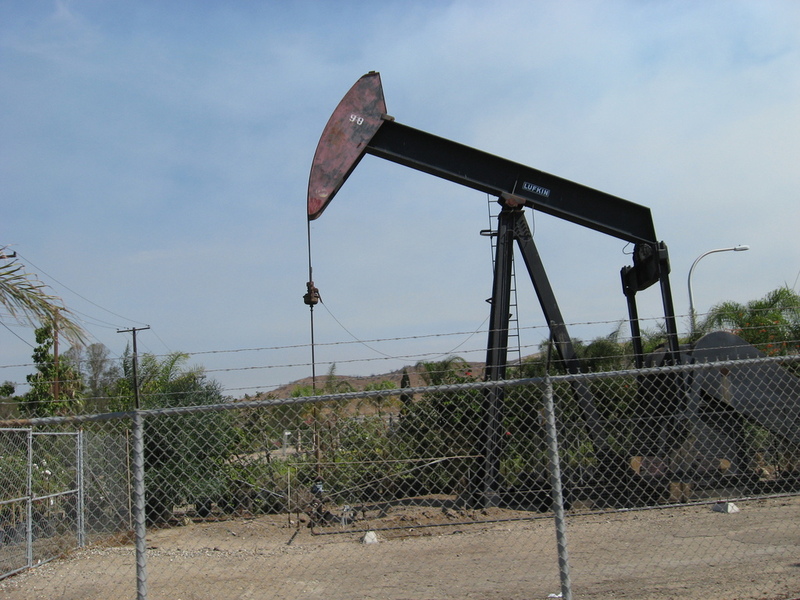 When I saw the oil wells, I knew I was there. 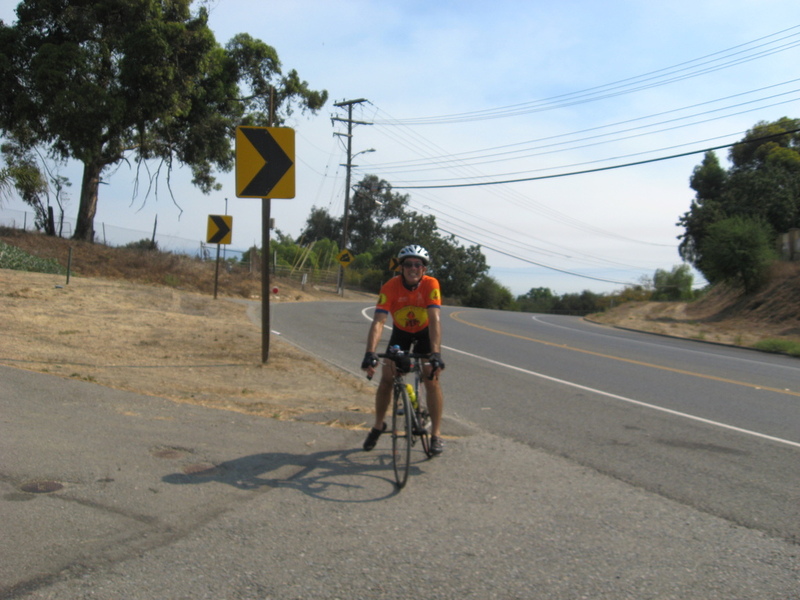 I rode around to Brea Blvd and turned right. 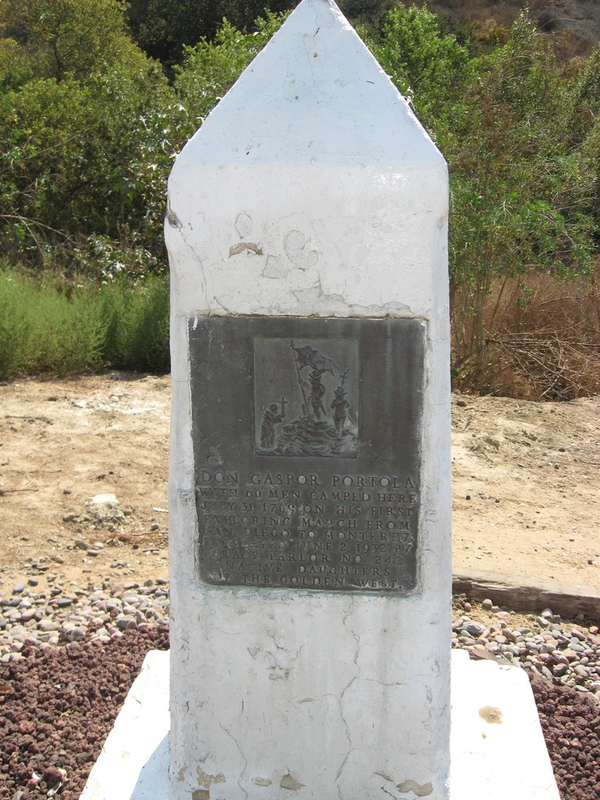 This brought me into Brea Canyon, where I saw the historical marker for Don Gaspar de Portola’s 1769 campsite. 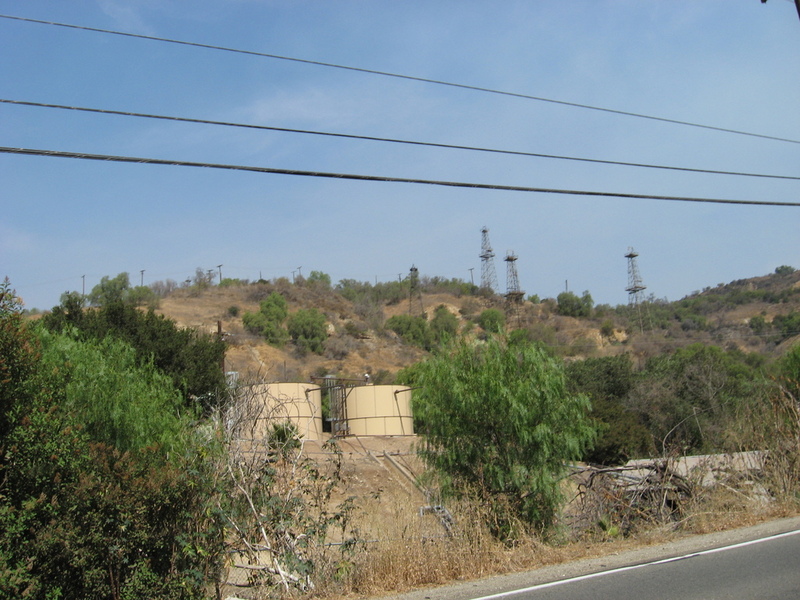 I also saw the small forest of oil derricks in the canyon. 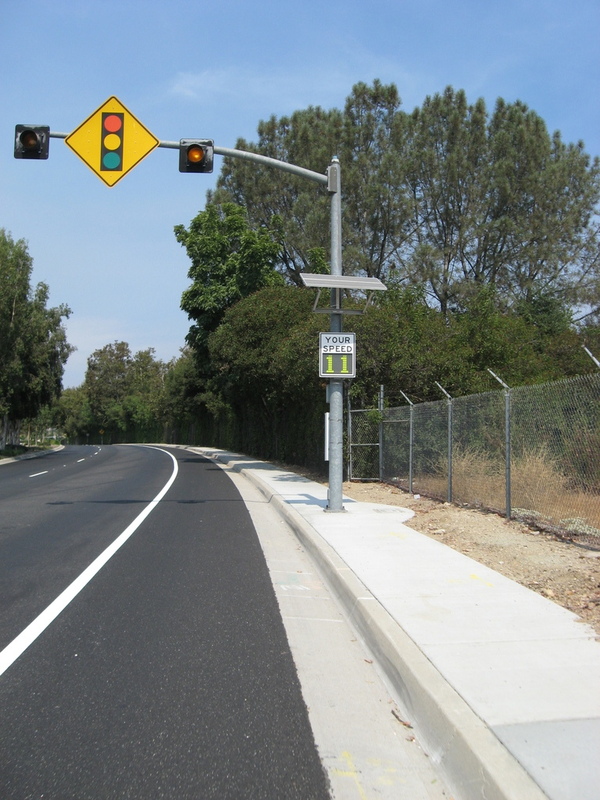 On the way back on Grand Ave, there was a speed sensor sign. It said I was going 11mph. It was uphill. At least it didn’t tell me to slow down. 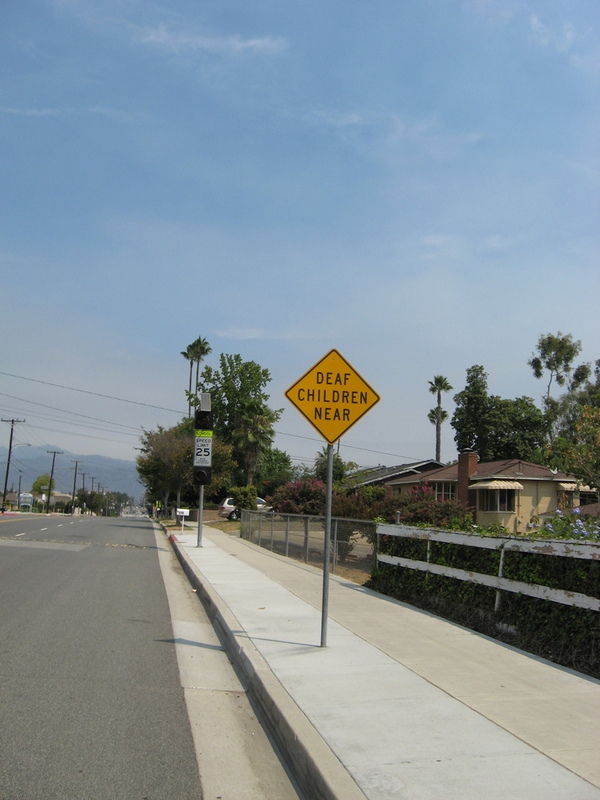 Back in Covina, I saw a warning sign to watch for deaf children. That was an unusual sight, but I guess there must be a reason for it. It was a nice ride. Clear air, even if it was pretty hot. 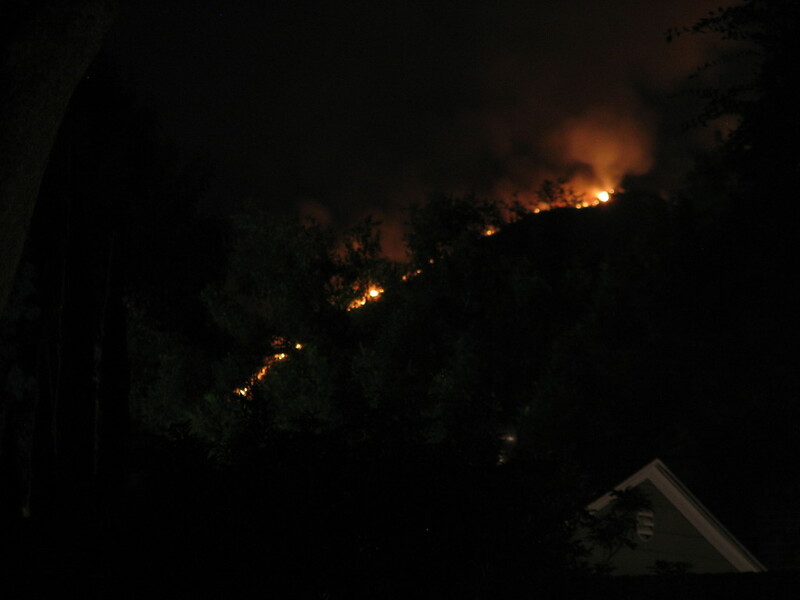 I stepped outside to see if I could see the glow from the fire, and instead, I could see the flames. Yikes. It’s been almost a year and a half since Cathy moved out, and the space where the couch used to be has been empty the whole time. Today, it was miserably hot here in Pasadena, and Lucinda and I were looking for something to do indoors. So we decided to go look for a couch. We went to IKEA and had a look there. In the end, we both liked one that’s really a sort of futon-like couch that can double as a bed, but not a very good one. More for occasional use only. But that’s all right. We don’t want it for the bed. 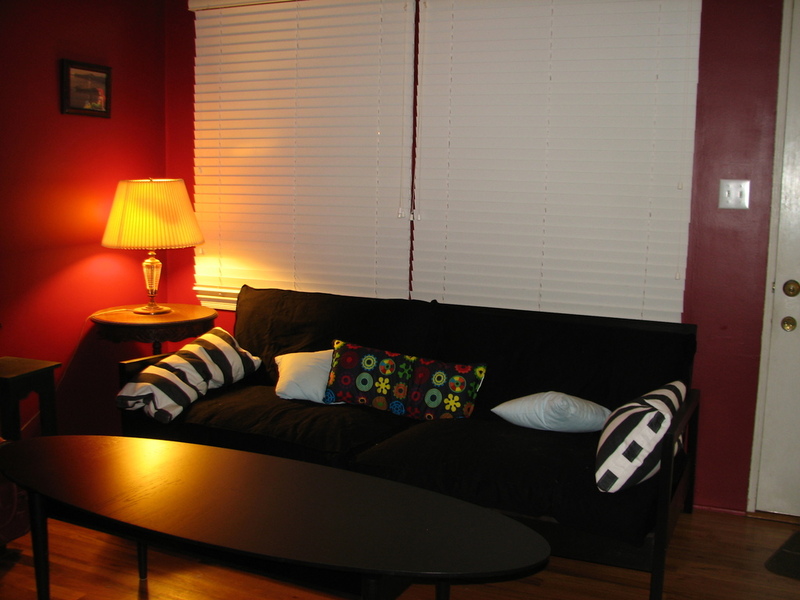 We just liked how it looked and felt as a couch. So we go that and some pillows and a coffee table. On a whim, we went through the lighting section, and I got a pair of small under-cabinet kitchen lights. 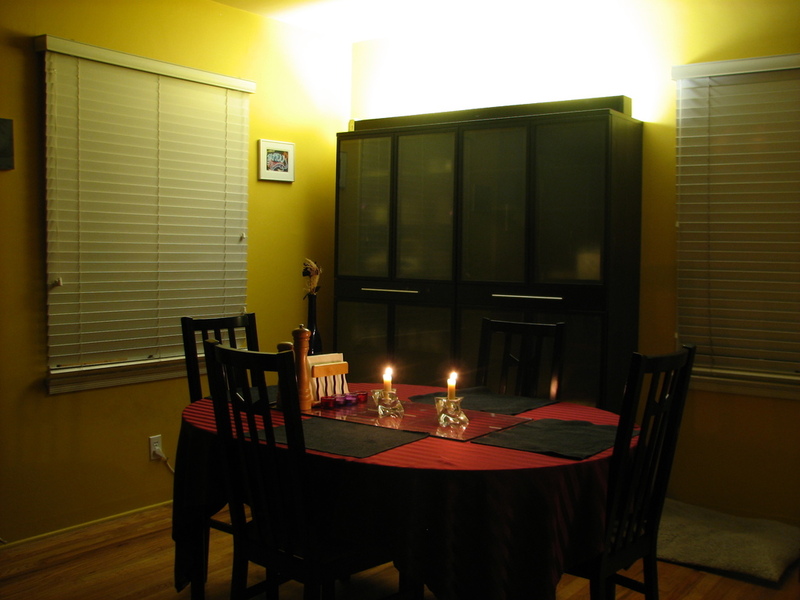 I’d had the idea of putting some lights like that on top of the new cabinets in the dining room. This would be so that we could have some soft indirect lighting in there for times when we don’t want the harsh overhead light on, but where candles are just not enough. So I made a wooden housing for them, complete with a switch box on the end to control the two lights independently. And the second picture shows what it looks like. It’s a nice effect. I’d set a goal of having a new couch by the end of 2009, so I guess I can cross that one off my list now. 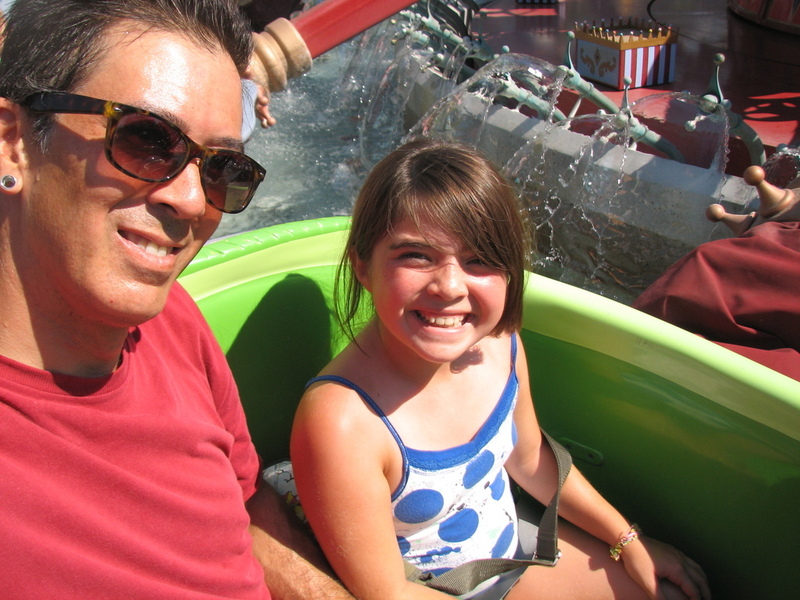 On Thursday, I took a vacation day to take Lucinda and her friend Claire to Disneyland. I’d promised her I’d take her one more time before school starts. It was very hot, which made for a sweaty day, but it also kept a lot of other people away. So the lines were very short. 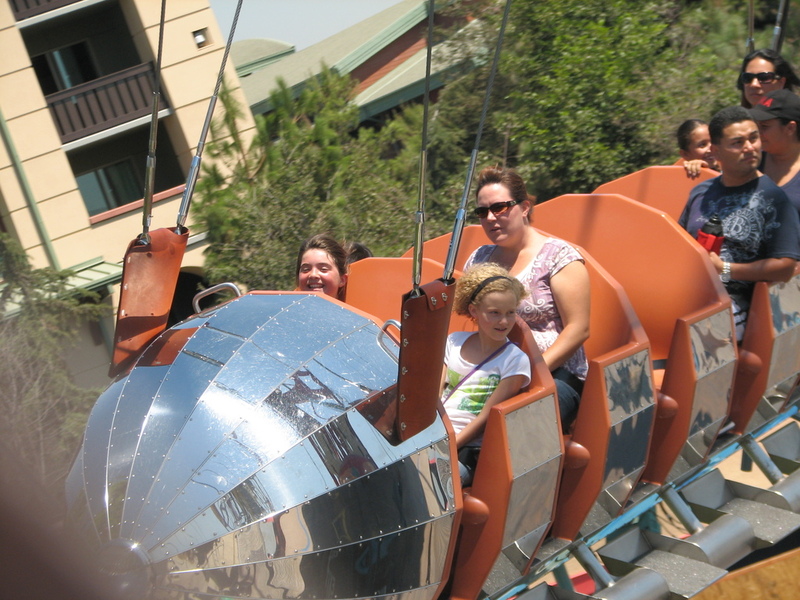 The highlight of the day had to be when Claire and I convinced Lucinda to try Gadget’s Go Coaster in Toon Town. 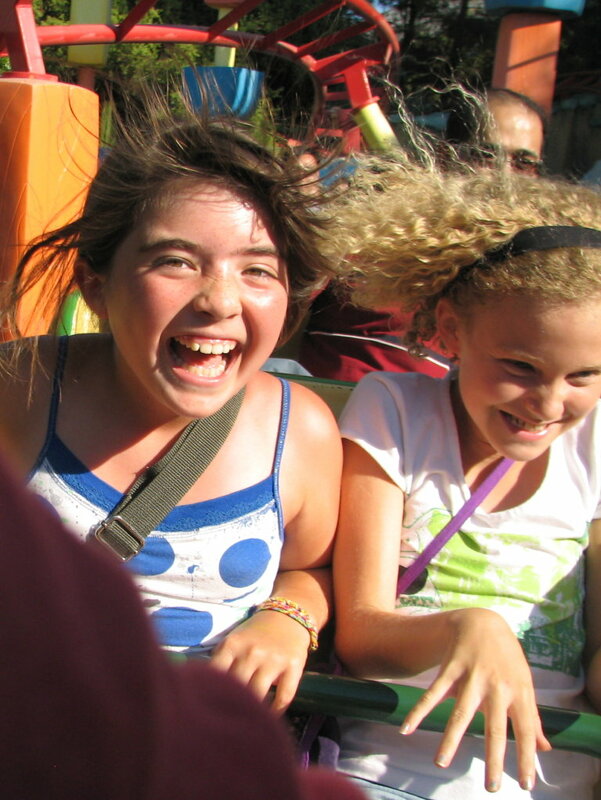 The last two times we were there, I rode it with Claire while Lucinda sat on a rock and watched us. She was pretty apprehensive about it, but at the end of the run, before the train even stopped, she said, “That was so much fun! Let’s do it again!” So we ended up riding it three times in a row. We were there from 11:00AM until nearly 7:00PM. 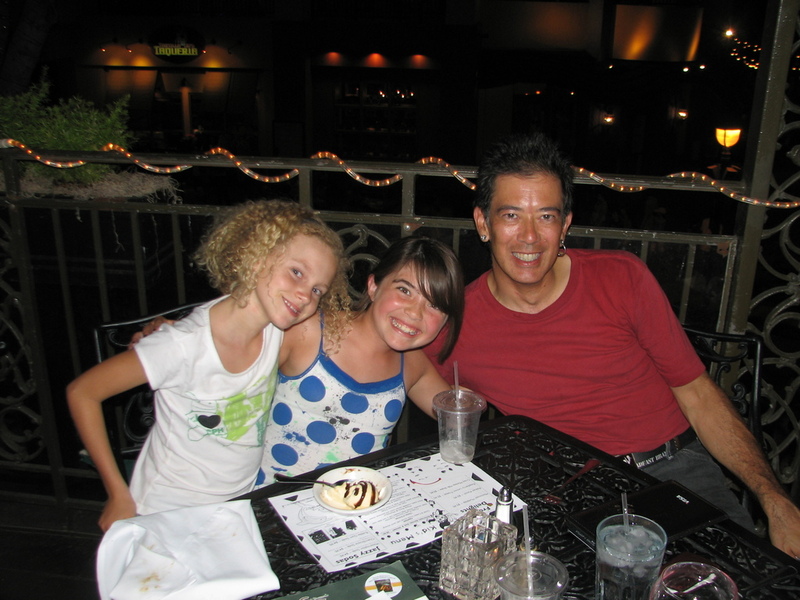 Then we went for the obligatory dinner at the Jazz Kitchen in Downtown Disney before heading home. I like to make a point of ending our days there, since the pictures from there have provided me a good measure of my progress in surviving the sturm und drang of the ongoing divorce process. And yes, it was a very fun day. On Sunday afternoon, Lucinda asked if we could go on another bike ride. So I took her on another local sightseeing ride. This time to see the Bunny Museum. It’s only about a mile or so from our house, although it’s all uphill to get there. So I took her there by a roundabout route that broke the climbing up into small chunks. The we stopped to admire the giant topiary rabbit in the front yard, and all the other bunnies around the yard. Then we rode home, which was all downhill. Today’s bike ride was another little sightseeing ride. This time, the destination was The Donut Hole in La Puente. This is a prime example of programmatic architecture, which in this case is a building shaped like the product sold there. The actual route out there was pretty straightforward and flat. This was a minor variation on a route we did last summer. When we got to The Donut Hole, we each took a souvenir photo in front of the big donut, and then a group shot, with the camera balanced on a rock. 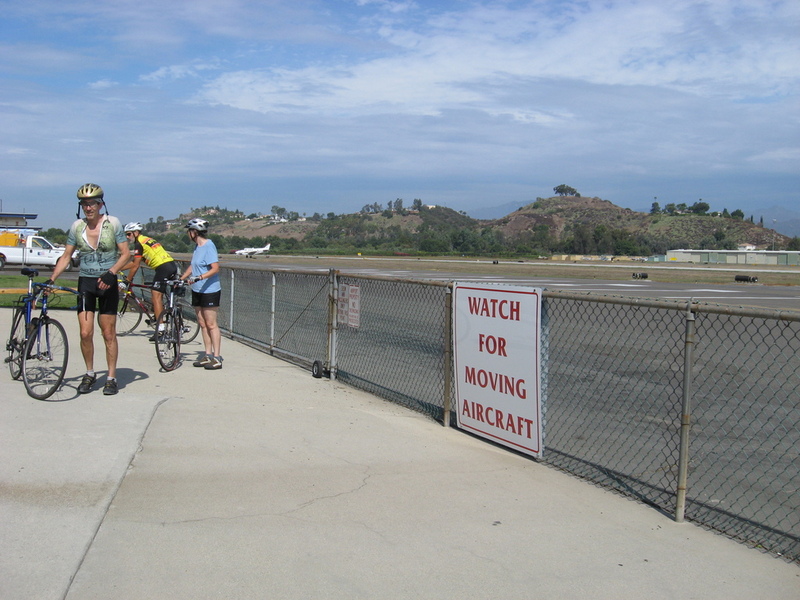 The snack stop was at Panera in West Covina, and the route home went over Santa Fe Dam and up the bike path. Then home across Monrovia and Arcadia. It was a fun ride. 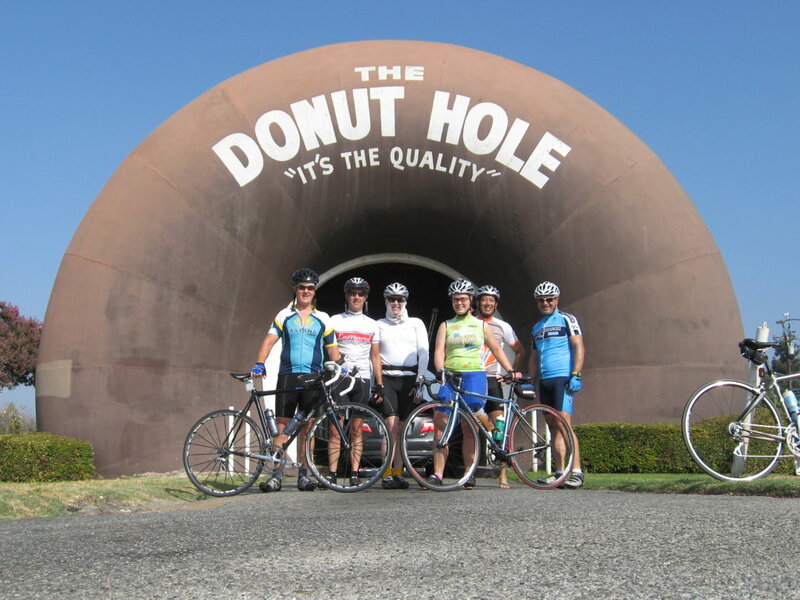 The route itself wasn’t all that exciting, but the Donut Hole made it amusing. Saturday afternoon, I went over to Hollywood for the big Tattoo Hollywood convention put on by BMEzine. I figured that because it was BME, it would be a good convention. And I also figured that a lot of people I know would be there. When I walked in the door, I immediately saw The Lizardman. We’d never met in person before, I’ve known him from rec.arts.bodyart back in the days when he was a grad student, and before he embarked on his show business career. I had a fun time schmoozing around and taking pictures. I met up with several other people who I’ve known online for years but never met in meatspace before. Late in the afternoon, Leslie came by, fresh off the plane from being out of town for the last few days. So I got to introduce her around, and she even has instant cachet in the tattoo scene, since she worked on the Modern Primitives book back in the ’80s. It was a very fun afternoon and evening. Pictures are in the usual place. 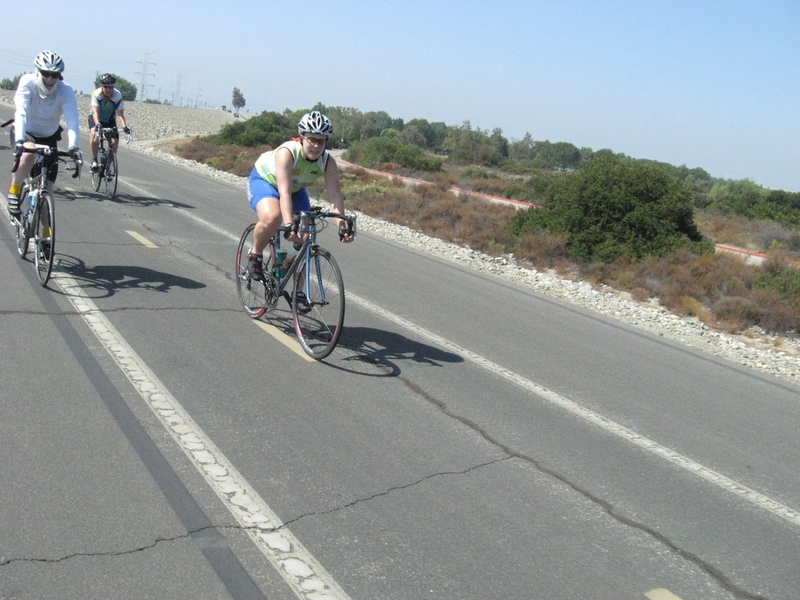 Today, I got to go on the Saturday club ride for the first time since March. 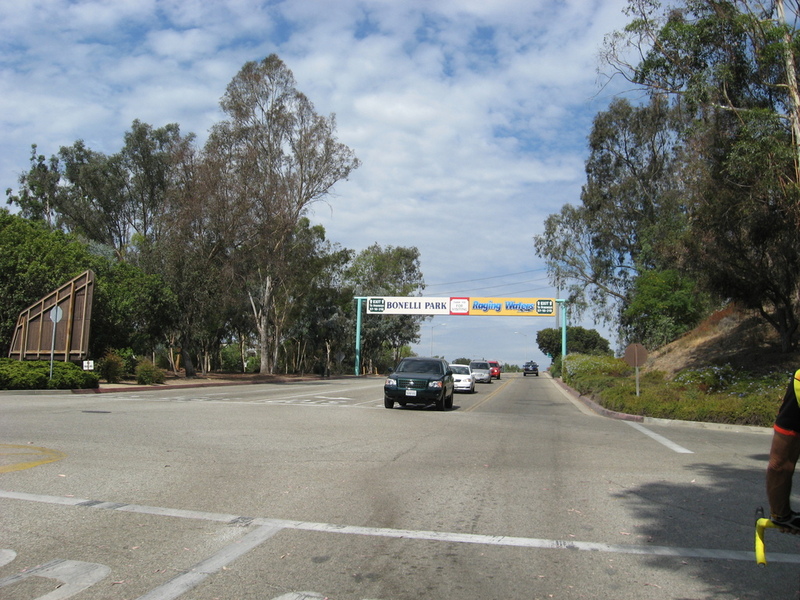 The ride was out to La Verne. It was a nice day, but the humidity was high by SoCal standards, so everyone was complaining about it. As always, the group fragmented immediately at the start. 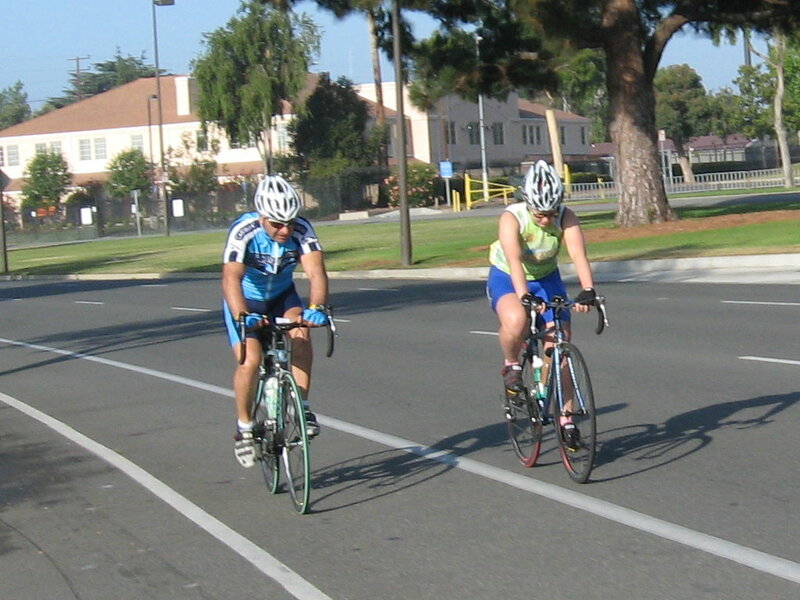 Gene and I were the fast group. 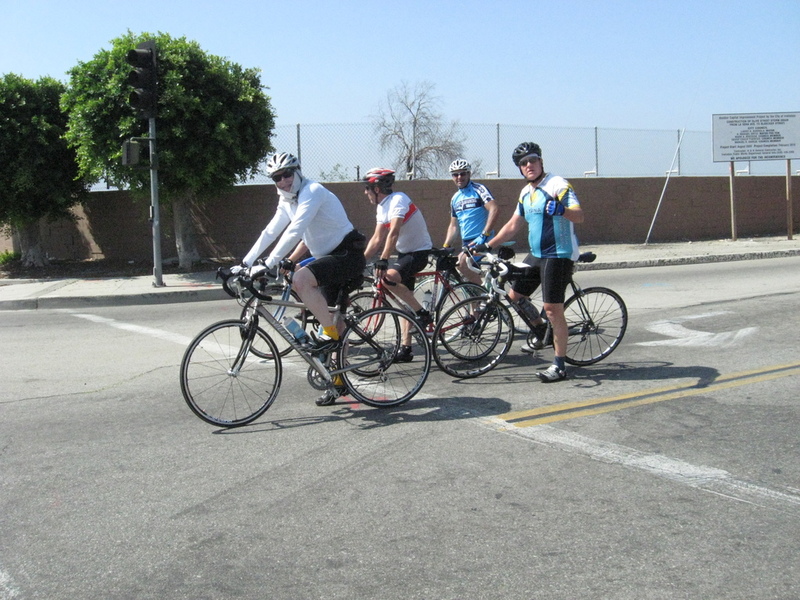 When we got to Gladstone St, we saw the PAA Coach Rick ride go by. 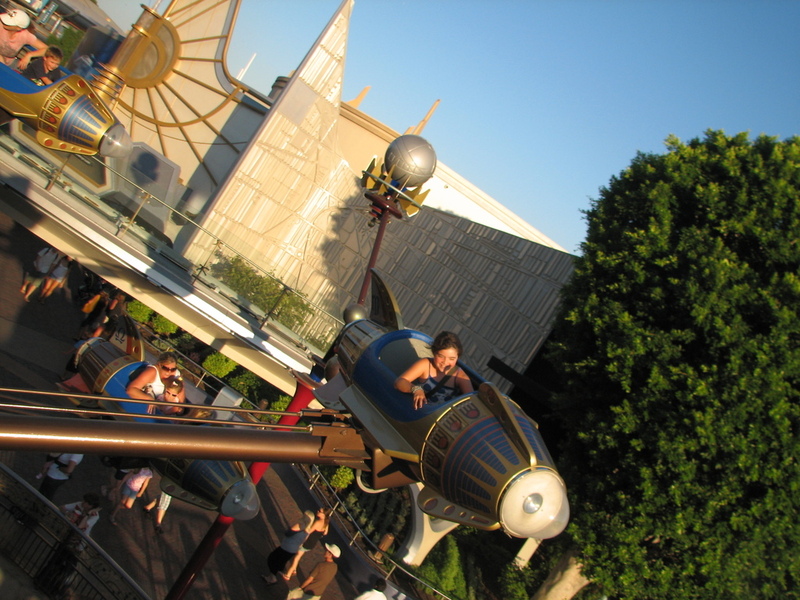 This was the ride that I went on once last March. A couple of the guys in the group were people we knew, so we chased them for a couple miles to catch up and talk. 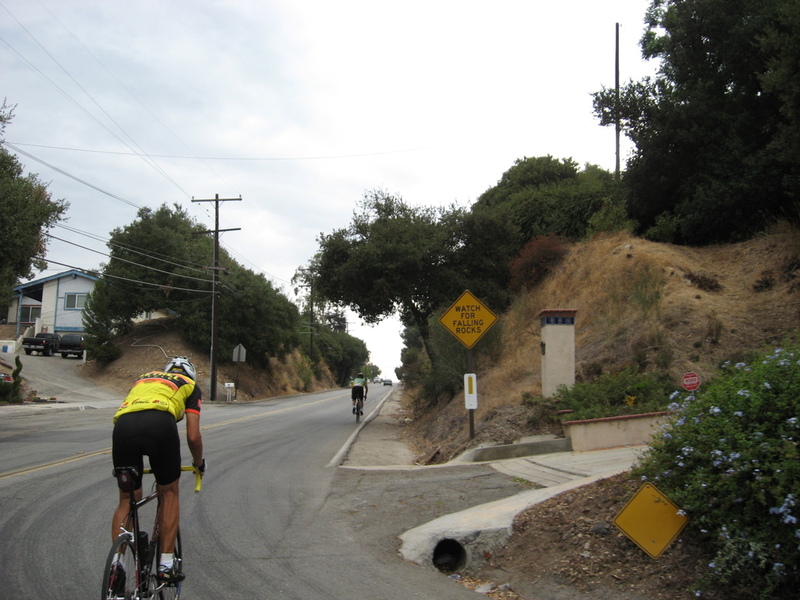 Then they turned off and we continued on to La Verne. We stopped at Coffeeberry, since they have a nice shaded patio. 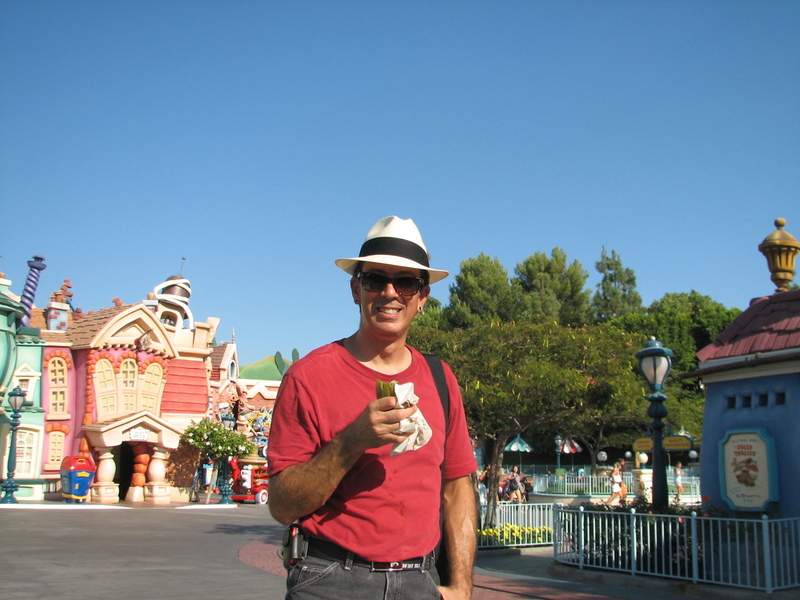 Then we continued on past the L.A. County Fair Grounds. I told everyone how I’m entering my blueberry muffins in the fair this year. 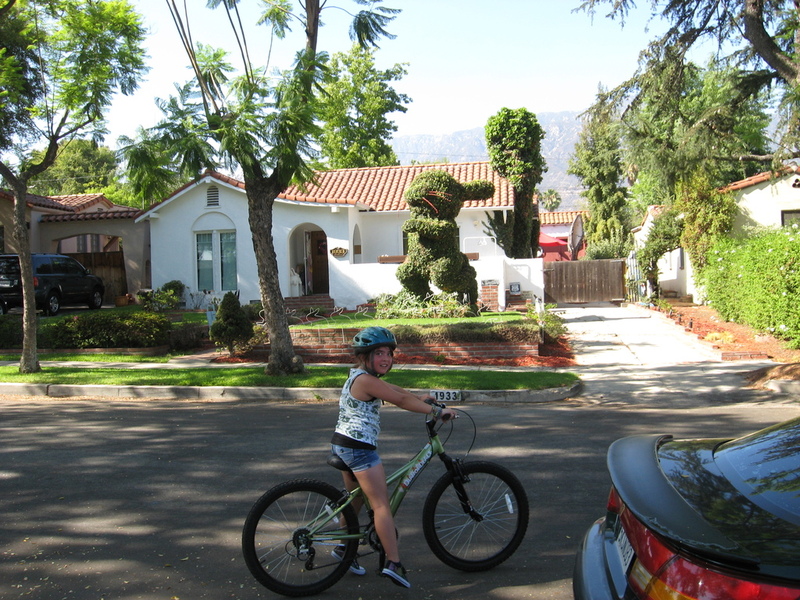 Then we rode into Bonelli Park, around the lake and then headed for home. 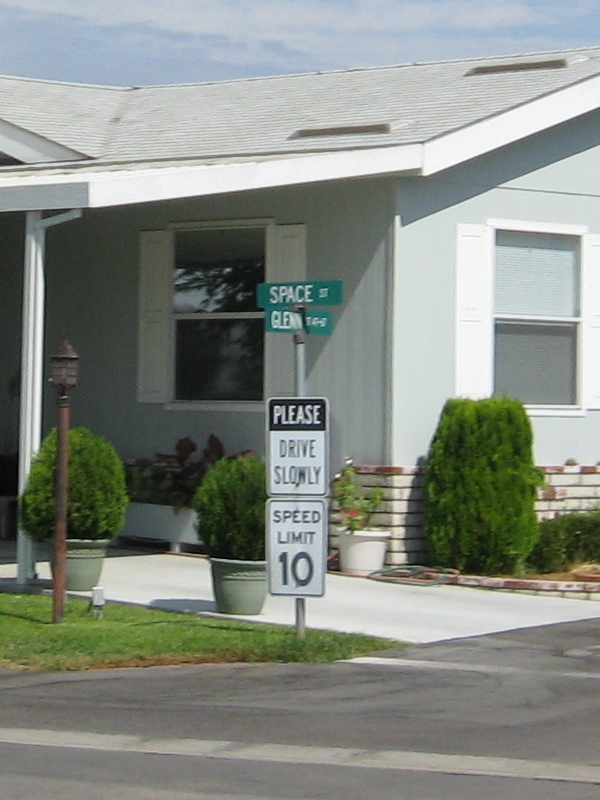 On the way back, I saw a trailer park where the front street was “Space St”, and the cross streets were named for the original Mercury astronauts. I think this will have to be a sightseeing trip some time in the future. This past weekend I took Lucinda down to San Diego. The plan was to visit Grandpa, and also to go to the Wild Animal Park. We went down on Sunday afternoon. When we got there, we picked up Grandpa and headed down to La Jolla Cove. I’d seen the seals there the last time I was in San Diego, and I knew Lucinda would like seeing them, too. When we got there, there we no seals. There were people on the beach, and the seals were all out in the water. They were just sort of bobbing in the waves and waiting for the people to leave. Whenever one would make a move to come up on the beach, a bunch of people with cameras would run over toward it. And of course, the seal would get scared off. Rule #1 of wildlife photography is: You get better pictures when you don’t scare the animal away. After the seals, we headed down to Balboa Park for dinner at Prado. As always, it was great, even if my friend Laura isn’t the manager there any more. Since we hadn’t really seen the seals, I promised Lucinda that we could go back there in the morning. And we did. They were all snoozing on the beach. Lucinda enjoyed seeing them, and I got some good seal photos. As always, my camera rocks. After seeing the seals, we had breakfast and headed up to the Wild Animal Park. We went on the tram ride around to see the African animals. Then we went and saw some of the other exhibits. We signed up for the ‘Photo Safari’ tour in the afternoon. This is the one where you ride in a stake-bed truck out into the Africa exhibit, and you can hand-feed a giraffe. I knew that Lucinda would like this. And it was fun. We all got to feed the giraffe, and also get licked by the big giraffe tongue. After that, we saw some more exhibits and the bird show before heading home. It was a nice weekend.